Fly fishing the clear waters of Jackson Hole, Yellowstone, and Grand Teton National Park is a magical experience. Especially when coupled with our expert and engaging guide service that will show you how to glide in to a clear, deep hole and land your trophy. The area’s home to a host of rivers and streams perfect for learning to fly fish or veteran anglers, including the popular Snake River, which meanders in braided patterns in front of awe-inspiring mountains. Jackson Hole is home to some of the best, most exciting dry fly fishing in the U.S. And it’s set against the stunning backdrop of mountain scenery in every direction teeming with wildlife. Learn how to fly fish, cast a fly rod, and angle for your trophy fish. Take casting lessons from fun, experienced guides to learn the subtle nuances of fly fishing. Or if you’d prefer an on-river refresher or crash course, sign up for wading trips and lessons. Up-to-date fishing reports for the Snake River, its tributaries, the South Fork of the Snake River, Salt River, Teton Park Lakes, Green River, and Yellowstone National Park. See closures, safety information, and more. Get the right fly for the right day on your Jackson Hole fishing trip. Grand Teton Fly Fishing made this handy hatch chart so you’ll know what fly the local fish are most likely to take on any day of the year. 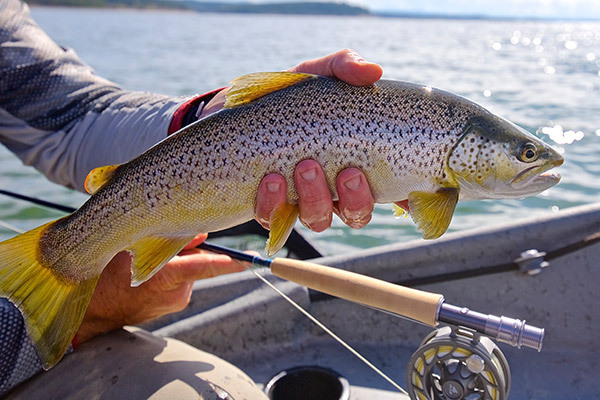 Every month in Jackson Hole offers unique fishing opportunities. Check our month-by-month timing chart for details or contact us directly and we’ll gladly help you with your fly fishing planning.